I have a new post coming soon with information about the classes I’m teaching this upcoming semester. For now, this socialist geography time capsule (1975-1983) just came through the wire, and I figured I’d pass it along. We’re pleased to announce that AntipodeFoundation.org is now the home of the archive of the Union of Socialist Geographers! Thanks to the tireless work of Jim Thatcher (University of Washington Tacoma), Eric Sheppard (University of California Los Angeles), and Clark Akatiff (one-time Professor/life-long professor of geography), we’re able to make available the USG’s Newsletters, published from 1975 to 1982, as well as its final publication from 1983, “Society and Nature: Socialist Perspectives on the Relationship Between Human and Physical Geography”. After a rewarding and draining trip out to Southern California, I’m back in Knoxville and beginning the adventure of catching up. I have posts about the Emotional Geographies conference I attended in Long Beach as well as some urban investigations in LA in the works, and both should be up by later this week or next. This photo comes from the Orange County Society for Conservation, which may or may not be directly related to the Society for Conservation’s at large. I’m just putting it here because this owl is adorable. The Society for Conservation Biology is pleased to solicit applications for the David H. Smith Conservation Research Fellowship Program. 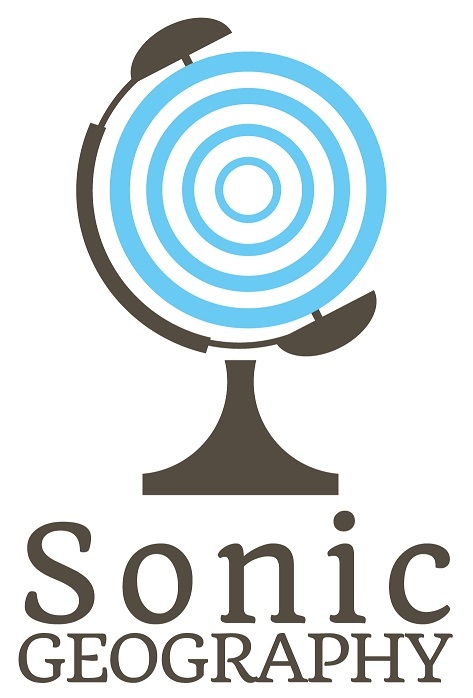 These two year postdoctoral fellowships provide support for outstanding early-career scientists of any nationality who want to better link conservation science and theory with policy and management, improving and expanding their research skills while directing their efforts towards conservation problems of pressing concern for the United States. Each Fellow proposes a team of at least two mentors: 1. an academic mentor who encourages the Fellow’s continued development as a conservation scientist and 2. a conservation practitioner who connects the Fellow and her/his research to practical applications. Fellows may be administratively based at either an academic institution or conservation organization in the United States, typically the location of either the academic or practitioner mentor. We encourage applicants to explore both options and consider being based at the non-academic institution as that is the world less familiar to most early-career scientists and can provide valuable experience. Fellows will spend up to three weeks per year during their fellowship attending Program-sponsored professional development retreats. These retreats provide opportunities to cultivate skills typically not covered during their academic education including: leadership, communications, professional and funder networks, and to gain better understanding of policy making and application of research. The Smith Fellows Program and its administrative host, the Society for Conservation Biology, are committed to equity, inclusion and diversity and invites individuals who bring a diversity of culture, experience and ideas to apply. We envision that the cadre of scientists supported by the Smith Fellows Program will eventually assume leadership positions across the field of conservation science. Fellows are selected on the basis of innovation, potential for leadership and strength of proposal. The deadline for receipt of application materials is 8 September 2017. The Program expects to select five Fellows in January 2018 for appointments to start between March and September 2018. Fellowship awards include an annual salary of $55,000, benefits, and generous travel and research budgets. For detailed proposal guidelines, please visit the Smith Fellow website. Questions may be directed to Shonda Foster, Program Director, by emailing sfoster@conbio.org. Please share within your professional networks! It’s always cool to see someone in your department speaking with the national press, especially at such a teachable moment for local policy-makers and an educational moment for those of us who didn’t realize quite how prone regions like this have always been to wildfires. I can’t re-blog the CNN Post, so I’ll link the original post (with the video) here, and I’ll post the article text below. All the best wishes to those affected by the wildfires in Gatlinburg and the surrounding area. The devastating wildfires that struck this week in Gatlinburg, Tennessee, could not have been stopped, experts say. Sudden winds reaching near-hurricane force caught people off guard, separated them from loved ones and forced thousands down tiny, winding mountain roads in pure panic. At least 11 people were killed and more are missing, some 700 structures have been lost and more than 17,000 acres have burned — most of them in the Great Smoky Mountains National Park. When not in a drought, the National Park Service has a very difficult time even doing a controlled burn because of the humidity in the air. Soehn says natural fires are very rare in the park. But according to a local fire ecologist in the area, wildfires in the region weren’t always a rarity. Grissino-Mayer has studied wildfires for over 30 years and, more specifically, those in the Southeast for 20. “Gatlinburg was made to burn,” he said. He says he’s been predicting a fire in the area for 15 years. Residents need to know that they are living in a very fire-prone region because of its proximity to a national forest, he explained. 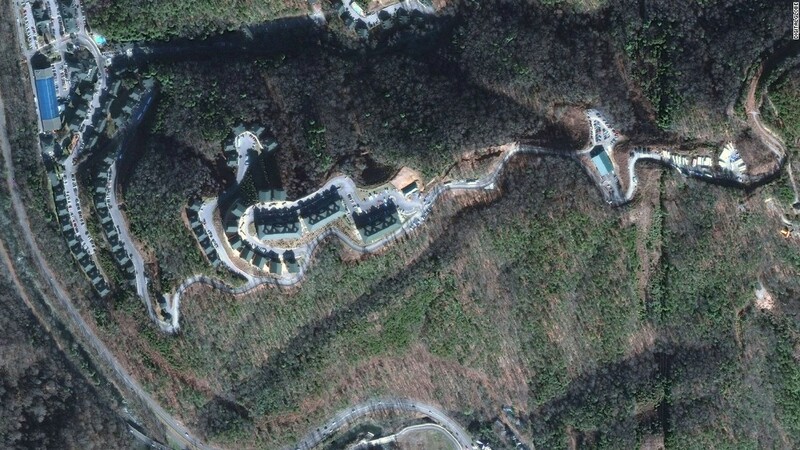 Being next to this big, uninhabited forest is the reason people build here, Grissino-Mayer says. “This is the Southeast at its best,” he said. And people want to have that rustic feel, he says, so they build beautiful wood homes on a hillside in the forest. Looking over the Great Smoky Mountains outside Pigeon Forge, Grissino-Mayer points out older trees that have been charred by wildfire in the past four years. Next to one charred stump, a log cabin is being built. Then he notices a fence that was recently installed alongside the charred remains of the old one. He says people will buy this cabin without realizing that the one before it burned in a wildfire. Tourism increased after World War II, about the same time wildfires started to diminish. 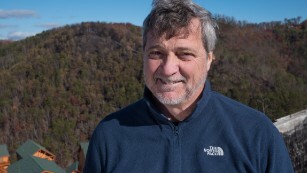 Grissino-Mayer is one of the world’s leading experts on tree rings. 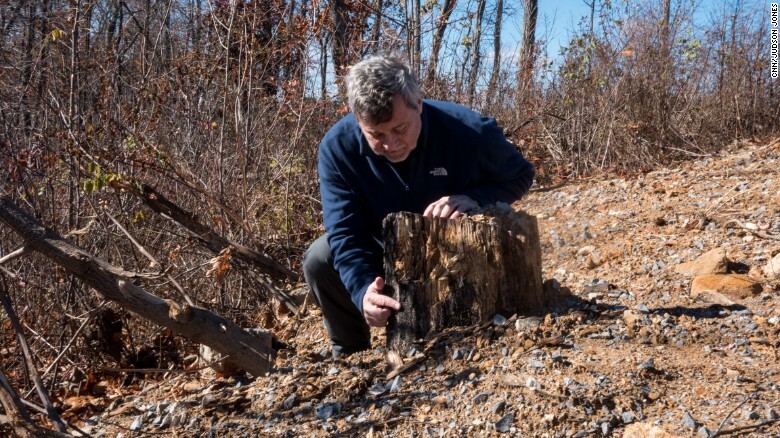 Looking at tree rings across the Great Smoky Mountains, he and his team have found a long history of wildfires. 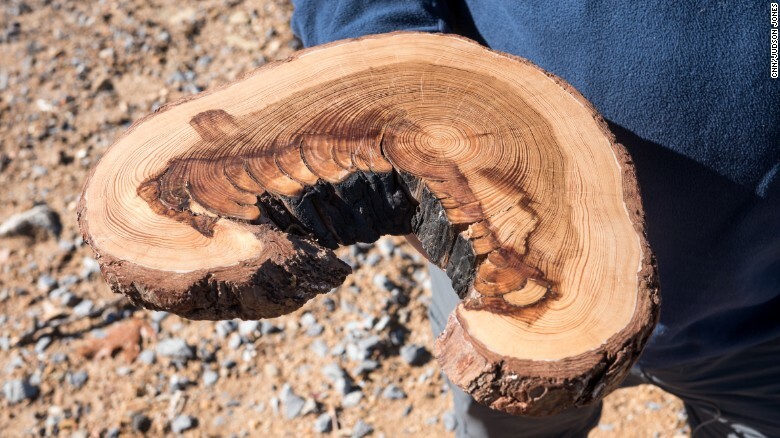 A slice of a tree has a series of rings, each one representing a year in the growth period of the tree. In the year of a wildfire, the fire leaves a scar along that ring. By looking at the scars, you can count the number of years between wildfires. Grissino-Mayer runs his finger along one slice of a tree. From the early 1800s to early 1900s, he says, there was a “low-intensity fire” about every seven years. These aren’t the kind of fires we are used to seeing today: They didn’t roar. Instead, they crept along the understory, the area beneath the tree canopy, near the ground. Fires were smaller because there wasn’t enough fuel on the ground to make them any bigger. That is, until the 1930s and ’40s. He points to an area near the edge of the slice that has almost no imperfections. This clean area represents almost a century without wildfires. Smokey Bear: More harm than good? “Smokey the Bear is probably one of the best educational tools a federal agency has ever come up with,” Grissino-Mayer said. It is now the public perception that wildfires are bad. Actually, he said, they’re beneficial. Forests need fires to recycle nutrients and clear the understory. Many species even require fire to thrive, he says, such as yellow pines, which must have a fire to regenerate. Dana Soehn agrees — when you talk about fire in relation to the ecosystem, there can be a mixed message when using Smokey the Bear. However, there have been times that Smokey is a good reminder of what things can cause a wildfire — like cigarette butts and campfires. Recently, Dolly Parton — who owns Dollywood in Pigeon Forge, near Gatlinburg — joined Smokey for a public service announcement that taught people how to prevent wildfires. Could Gatlinburg fires have been prevented? “I don’t think (the wildfire) could have been prevented,” Grissino-Mayer said. Soehn and others working the incident also believe there was nothing that could have stopped the extreme winds that rapidly spread the flames.The fire had been slowly creeping through the understory for days, said Soehn. By Monday morning the fire had only grown to 35 acres and the National Park Service alerted the surrounding communities. By the afternoon, based on the forecast winds, fire breaks were bulldozed around neighborhoods thought to be in the path of the fire. By 5 p.m. the fire had reached the city limits. When the winds started topping out at 80 mph, fires started spotting — carrying embers very far away and igniting new fires. The wind even knocked down power lines, which, in turn, sparked new fires. Just one hour later, Soehn says, the Gatlinburg Fire Department was battling 20 different structure fires. Grissino-Mayer believes that education would’ve helped saved lives and structures. Soehn says the park service is proactive when it comes to education. “With the way the conditions and winds were in this situation I don’t think this would have helped,” she said. Grissino-Mayer says Gatlinburg could have probably been evacuated sooner, even though he understands how fast the fire flared. After the incident is over there will be teams that evaluate and review response and recovery efforts, she said. Grissino-Mayer says people must be aware of the environment and the forest in which they live, and they must understand that fire always has been and always will be a part of these forests. CNN’s Brandon Miller contributed to this report. The Geography Program at West Virginia University is currently recruiting five funded graduate students for 2017-18 academic year. WVU Geography offers both Masters and Doctoral degrees and a rigorous certificate program in Geographic Information Science. Our rapidly growing graduate program is composed of 19 core geography faculty with expertise in the interdisciplinary subfields of Human Geography, Environmental Geography and GIScience (http://www.geography.wvu.edu/people). WVU Geography faculty are engaged in local, regional and global research focused on human-environment relations, climate change, political geography, spatial science, digital humanities, forest ecosystem modeling, cultural and political ecologies, conservation science, feminist geography, science and technology studies, humanitarianism, land change science, critical cartographies, food justice, and development geography. Faculty are currently conducting research in South Asia, Latin America, Sub-Saharan Africa, the Middle East, East Asia and the United States, including Appalachia. The geography faculty are recruiting for 5 Graduate Research Assistant positons on funded projects. Applicants interested in the Graduate Research Assistantships described below are encouraged to contact the research faculty prior to applying. Applicants must submit a CV and research statement addressing specific interests and qualifications for the potential research topics outlined below. In addition to the specific qualifications for these positions, potential candidates must meet the admission standards and be fully accepted into the Geology & Geography Department at WVU. Transcripts, test scores, and all other completed application materials are due January 1, 2017 for Fall 2017 admission. You can access the application portal here: https://graduateadmissions.wvu.edu/. This study will focus on the dual nature of water in West Virginia: a resource towards economic transition and/or a source of concern due to its polluted and destructive nature. This study will be based on a case study methodology where experience with qualitative methods is required and knowledge of GIS is welcomed. This research project is based in the Okavango Delta, Botswana and focuses on understanding how existing social vulnerabilities related to gender and ethnicity result in differential adaptive capacities for people in changing environments. RA responsibilities will include assistance with research design, fieldwork in remote locations, and data analysis. Mobile ground-based lidar and aerial lidar, in conjunction with WorldView-3 satellite imagery, offers new opportunities for mapping wildfire burn severity using remote sensing. RA responsibilities will focus on ground and aerial lidar analysis; prior experience with working with lidar for vegetation analysis is preferred. This research fellowship is housed within the Food Justice Lab at WVU and focuses on food sovereignty and the potential of cooperative enterprises in advancing social and economic change in West Virginia and Appalachia more broadly. RA responsibilities will include research assistance on the WV FOODLINK community food security project (http://foodlink.wvu.edu) supported by USDA and regional foundation grants. GIS background is desired. Fellows will join a dynamic community of graduate students in the Food Justice Lab who are advancing alternative economic futures. The goal of this project is developing framework and applications of personal VR system centered in geovisualization for spatial analysis, science communication, geography education, and many more areas of geography. RA will be required to have some experience of computer programming and GIS software. Doctoral Applicants: Funded Ph.D. students will be guaranteed 3 years of funding contingent upon progress within the program and are eligible for continued funding in years 4 and 5, based upon performance. Master’s Applicants: Funded M.A. students are guaranteed 1 year of funding contingent upon progress within the program and are eligible for continued funding in year 2, based upon performance. WVU recently attained R1 Carnegie Ranking and Geography is a respected Program of Excellence at the university. We are located in Morgantown, a vibrant town repeatedly ranked as one of the best small cities in the country (http://www.morgantownwv.gov/about/awards) and located just 75 miles south of Pittsburgh. 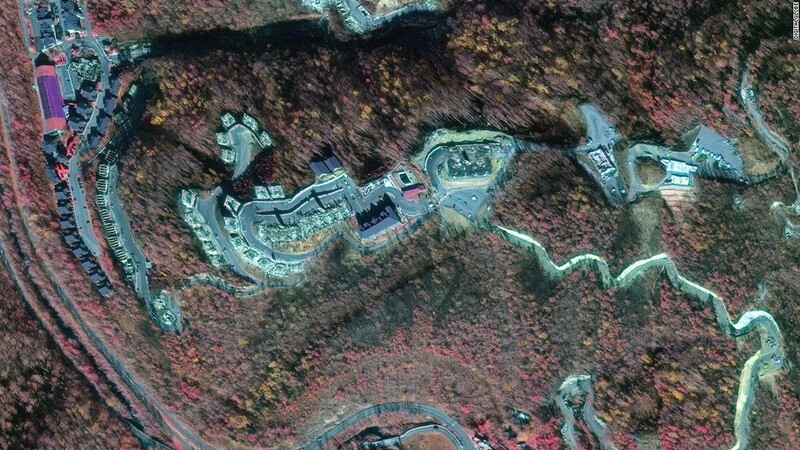 The Geography Program is housed in a state of the art research facility and students have access to some of the best outdoor recreation opportunities in the East (https://diyoutdoors.wvu.edu/). West Virginia University is an Equal Employment Opportunity/Affirmative Action Employer dedicated to building a culturally diverse and pluralistic faculty, staff and students committed to working in a multicultural environment. The university welcomes applications from all qualified individuals, including minorities, females, individuals with disabilities, and veterans. Yesterday I was tagged in a post by an old high school friend, asking me and a few others a very public, direct question about white privilege and racism. I feel compelled not only to publish his query but also my response to it, as it may be a helpful discourse for more than just a handful of folks on Facebook.